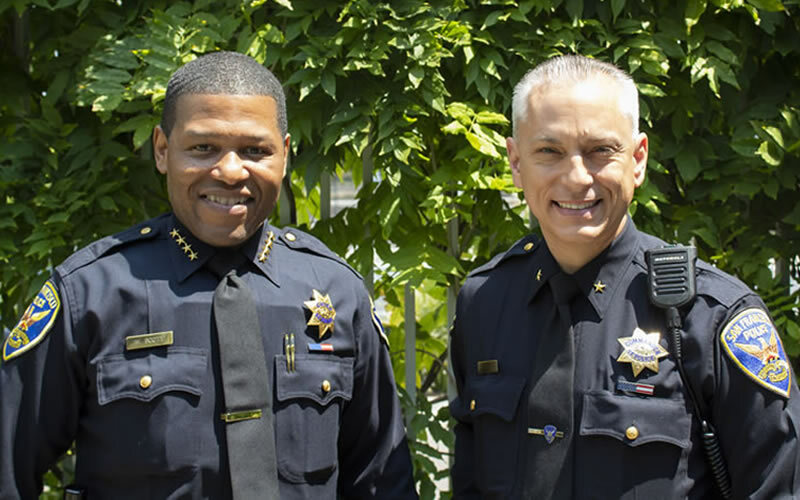 At the start of our seventh summer of Future Grads, sf.citi sat down with San Francisco Chief of Police William “Bill” Scott and head of the San Francisco Police Department (SFPD)’s Community Engagement Division, Commander David Lazar. While Future Grads launched before Chief Scott took charge of our city’s police force, he was quick to recognize the program’s value for young San Franciscans. Q: How do you think sf.citi helps connect San Francisco youth with the city’s technology community? Chief Scott: First of all, I think giving the youth an opportunity that they would probably otherwise not have. And so much of the future is about, not only getting opportunities, but the proper preparation when you do get an opportunity. And I think this is huge. There are all kinds of correlations between education and future success. Future Grads, for a lot of these kids, is really an opportunity that will get them where they want to be and help prepare them for that. Future Grads is one of the rare programs that brings the SPFD in direct contact with the tech community, both committed to grooming the next generation of San Franciscans for success in our tech-powered city. Building off our experience with Future Grads, we wanted to know what else can be done to strengthen the city’s partnerships with tech. Commander Lazar weighed in. Q: How do you think tech can be a strong partner to San Francisco? Commander Lazar: I think it all really starts with communication and relationships with us—having the ability to have that connection between the department and the tech industry and talk about what the possibilities are. Future Grads is a perfect example of somebody brainstorming seven years ago how the police can facilitate bringing youth to the table and employment for the summer. Our suggestion would be to keep that open dialogue so that we can figure out new ways to come up with ideas that help the youth and others. Q: If you could create an app to improve San Francisco, what would it be? Chief Scott: We have mobile apps so people can request service and report things. A mobile app to speak directly to us, I think would be really, really great. A lot of what we have right now has to go through somebody else before we can get the information that we need. Not only that, but something that would facilitate two-way communication. I mean be careful what you ask for because that’s a huge thing to manage, but communication directly with the people that we serve is really, really important. The easier and more convenient that we can do that, the better off we are. Commander Lazar: Just to add what the Chief said, an app that would provide information on all 58 city departments, specifically the programs and the services that DCYF offers. To the Chief’s point, we have a lot of apps—we have 311—for requesting or making a complaint about things, but nothing that really speaks to everything that’s done in the city. And we’re doing so much as a city. Chief Scott and Commander Lazar touched upon a few themes (read: collaboration and two-way conversation) that you might just see again in future editions of “Tech Talks with sf.citi.” Stay tuned to hear what others in our community have to say about sf.citi’s work and improving our city. As an added bonus, you may just uncover the inspiration for your/your company’s next app—straight from fellow San Franciscans! Let us know who you’d like to hear from next by emailing jacqueline@sfciti.org.